Most people who take prescription medication relate to the experience of occasionally missing a pill. For those who juggle multiple prescriptions, forgotten doses can become a regular occurrence. Durham, NC, company HAP Innovations believes it can resolve those problems with a device that tracks all of a patient’s pills and dispenses them precisely when they must be taken. The pills would come from the pharmacy sorted and packaged in a cartridge. For many patients, the usual way to sort medication is with a pill box containing multiple compartments, each compartment holding a dose. Some people turn to a mobile app, such as MediSafe or Mango Health, for medication reminders. But a pill box can’t remind you to take your meds, and a mobile app can’t sort them. Rhoads says the time is right to offer new ways to improve medication adherence. The nation’s elderly population—the group that takes the most prescription medication—is growing. Under the Affordable Care Act, pharmacies are expected to take on a greater role in patient care. Consumers can already buy automated pill boxes that offer reminder alerts from companies such as Needham, MA-based MedMinder. HAP is taking what it says is a more comprehensive approach to medication management. HAP combines automated pill dispensing with telecommunications capabilities that extend the pharmacy’s reach into the home via an Internet-connected device. Rhoads believes this convergence of technologies in a single device will set HAP apart from the pack of automated pill boxes. The yet-to-be-named HAP drug dispenser is not yet commercially available. While HAP does have a prototype, the company won’t release any images showing what it looks like. But Rhoads describes it as a countertop device about 10 inches high and 13 inches long. Patients will be able to view health information on the device’s 7-inch capacitive screen, which the company envisions playing an additional telemedicine role connecting the user to a doctor, a pharmacist, or caregivers. The device will also use Bluetooth technology to gather data from other devices in the home, such as health monitors, and input that information into a patient’s electronic health record. HAP is a new company but it comes from an established player in pharmacy automation—Parata Systems. Parata, also based in Durham, makes robotic systems that sort and dispense pills in pharmacies. The devices are intended to help pharmacies reduce prescription errors. The robots also free pharmacists to do things robots can’t do, such as counseling patients. Earlier this month, HAP spun out from Parata as a separate company, supported by a seed investment from HAP Investment Group—the same German firm that made the first investment in privately held Parata when it was founded in 2001. Parata had developed the home drug dispensing device as a project within the company over the last 15 months. Rhoads, who left his position as Parata’s CEO to lead HAP, says the plan was to spin off the consumer-oriented project as a separate company, leaving Parata to continue its focus on pharmacies. Though HAP is moving into separate Durham offices, Rhoads says it will continue to use Parata for engineering expertise and manufacturing capabilities. When the dispensers reach the market, Parata will service them. Parata will also play a key role in HAP’s business model. Roughly 9,000 pharmacies across the country use Parata robots to sort and package pills in small, clear, plastic pouches. Rhoads says patients who have HAP’s devices will be able to pick up their medications, sorted and packaged in cartridges, from one of those pharmacies. When the drug dispensers become available, HAP’s closest competition could be PillPack, a Manchester, NH, startup. 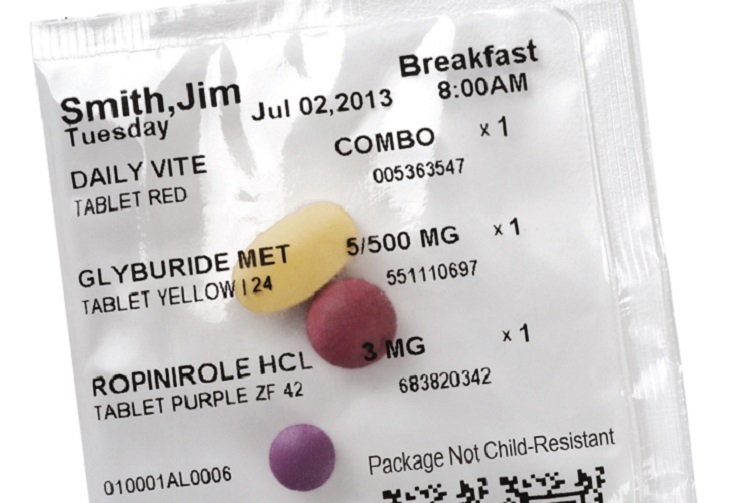 PillPack already provides pills packaged in individual packets imprinted with instructions, much like Parata. But PillPack mails its pills to patients, filling prescriptions with a pharmacy sorting and shipping service that it built on its own. PillPack also allows patients to manage their prescriptions online via a secure website. Rhoads expects to bring HAP’s drug dispenser to market in about a year. Besides figuring out a name for the product, the company needs FDA regulatory clearance on its dispenser as a class 1 medical device, the lowest-risk classification for medical devices. HAP is still working on pricing, but Rhoads says patients could pay a monthly fee rather than a high upfront cost. If HAP is able to convince insurers to reimburse for the device, the out-of-pocket cost to consumers would be even less. Rhoads envisions patients picking up the devices at their local pharmacy, where the pharmacist would counsel the patient and configure the device to dispense medications according to each patient’s prescription schedule. “The only thing that the patient has to do when they get home is plug it into the wall,” Rhoads says.